The suburb of Manuka in Canberra is an extrememly small little pocket that is well known for being one of the more exclusive areas in the nation's capital. Manuka is surrounded by a number of other larger suburbs including Kingston, Barton, Griffith, Forrest, Deaking and Red Hill. There is plenty of parkland garden areas situated around Manuka including Collins Park, Flinders Park and Telopea Park. There is also lots of space around Canberra's premier sporting field, Manuka Oval, where you will find a children's playground, the Manuka swimming pool and also the Manuka Arts Centre. The area surrounding this vibrant suburb has plenty of government department buildings, corporate offices and retail outlet stores in the shopping precincts of Kingston and Manuka itself. Travellers wanting to stay close to everything that Manuka hos to offer will find that there is a large range of luxury hotels and fully self contained serviced apartments in nearby Forrest, Kingston, Barton and Griffith. Manuka is also just a short drive from the numerous tourist attractions that Canberra has, which is where this area is such a sort after place to stay during your visit to Canberra. Even you are travelling to Canberra for business or work then the Rydges Capital Hill is the ideal place to stay because it is conveniently positioned on the corner of Canberra Avenue and National Circuit just a short distance from Parliament House and many government department buildings. Another great thing about the Rydges Capital Hill Hotel is that it is just a short walk from Manuka Village with its diverse range of quality restaurants, contemporary cafes and exclusive shops. With a great parkland setting and convenient location close to many of Canberra's major attractions including the Parliament House, National Gallery, Questecon and National Portrait Gallery the Forrest Hotel and Apartments is a unique place to stay. Another great thing about staying in this affordable Canberra apartment accommodation is that it is only a short stroll from Manuka's sidewalk cafes, restaurants and shops. With a range of 1 & 2 bedroom self contained serviced apartments that are conveniently located just minutes from the Parliamentary Triangle the Bentley Suites Canberra is a great place to stay. Ideal for leisure and sporting travellers, tourists and corporate business travellers the Bentley Suites is also only a short stroll to the Manuka and Kingston villages, which offer a diverse range of cosmopolitan restaurants and exclusive shopping. If you are an overseas or interstate traveller to Canberra then you will not doubt want to take a tour of the Australian Parliament House, which is located just a short distance from Manuka. This is where the Australian parliament sits on a regular basis and you can take a free guided tour around this complex and learn lots of interesting things. Being the capital of Australia the city of Canberra is home to a large number of embassies from different countries all over the world. Each embassy has its own unique design and construction reflecting the country of origin. These embassies are located to the west of the Parliament House and are just a short drive from Manuka. Just a short drive up Kings Avenue from Manuka will get you to the Australian War Memorial, where you will be able to pay your respects to the fallen men and women who have served in wars for Australia over the centuries. In the neighbouring suburb of Kingston you will find the new redeveloped boat harbour and waterfront precinct on the edge of Lake Burley Griffin. This area is filled with quality apartments, boat mooring facilities, shops and food outlets and is a relaxing place to spend an afternoon whilst in Canberra. The National Gallery of Australia is situated on King Edward Terrace close to Manuka and within its walls you will find lots of amazing works of art from local and international artists. The gallery also features a lovely sculpture garden outside and features unique art exhibits throughout the course of the year. No trip to Canberra would be complete without a trip to Questecon, the National Science and Technology Centre. It is situated on the banks of Lake Burley Griffin and is a fun day out for adults and kids of all ages with lots of hands on exhibits and interactive displays that will challenge your mind and have the kids learning without them even knowing it. For people staying in and around Manuka the main shopping area is the Manuka Village Shopping Precinct which is situated around Franklin Street, Furneaux Street, Bougainville Street and Flinders Way. This suburban shopping strip is centrally located, has plenty of parking available and features an array of designer fashion boutiques, quality restuarants, cosmopolitan cafes, variety stores, book stores and even a major supermarket for all of your day to day needs. 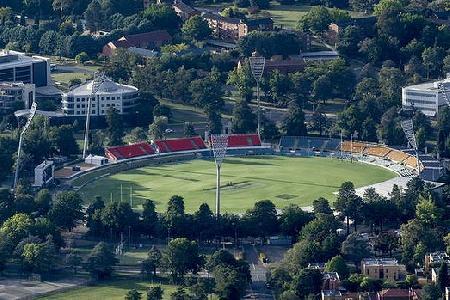 Just to the north of the Manuka shopping centre is Canberra's premier sporting ground, the Manuka Oval. This boutique stadiumplays host to numerous AFL footy matches and major cricket matches, as well as smaller suburban matches will find out the course of the year. Just a short drive to the east of Manuka will get you to the very popular Fyshwick Fresh Food Markets which are only open on Thursday, Friday, Saturday and Sunday. This extensive market includes a comprehensive variety of fresh seafood, quality meats, locally grown fruit and vegetables, Asian groceries and delicatessens. The Fyshwick market also has a number of cafes where you can enjoy a coffee and something to eat during your shopping. If you are interested in golf then you should play a round of golf at the nearby Federal Golf Club during your stay in Manuka. This beautiful golf club is surrounded by hills and is located just a short drive south of Manuka. The Federal golf club is an excellent place to spend an afternoon to escape from your busy work life.